Lisbon, Porto and the Algarve are by far the most popular destinations in Portugal. Because of this, most visitors do not venture further inland. It is a real shame because the central Portugal region (“Centro Region”) is equally as scenic and picturesque as other regions of Portugal. Would you like to know more about the town or cities to visit in central Portugal? They are probably under the radar, but they are intriguing and captivating places rich in history, cuisine and cultural wealth. 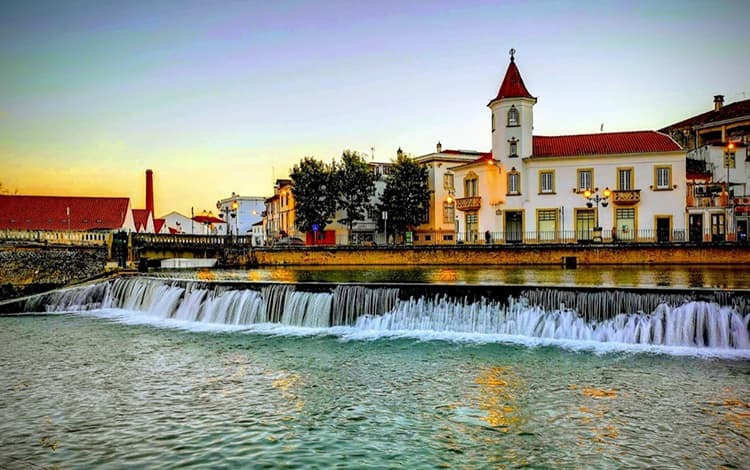 From Aveiro to Évora, central Portugal has so much natural beauty and these cities and towns make for the perfect holiday destinations so you can explore this beautiful country. Read on to see 20 places you must visit in central Portugal. Coimbra is one of the most historic cities in Portugal and the home to the oldest University in Portugal (University of Coimbra). It is a medieval city with a vibrant atmosphere, deep cultural heritage and the second home to Fado music in Portugal. Some of the main attractions in Coimbra are the University Building – a world UNESCO heritage site and the Old Cathedral of Coimbra (“Sé Velha de Coimbra“); one of the most elegantly designed buildings in the city with Romanesque architecture. 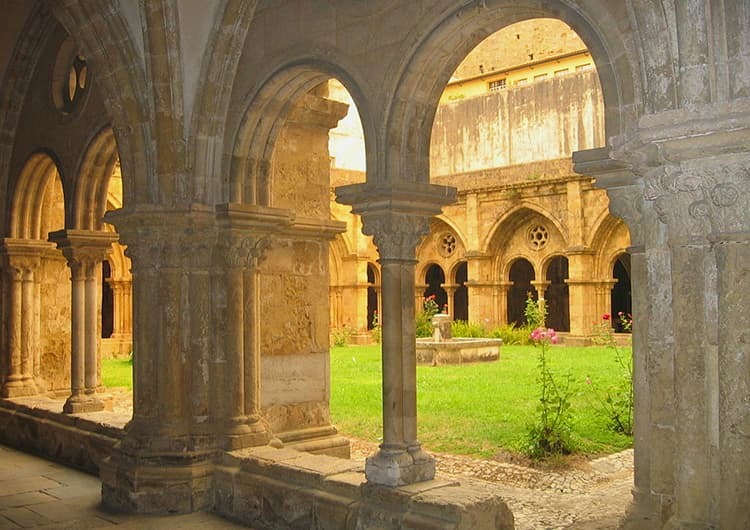 The cloister of the Old Cathedral of Coimbra, Portugal. As usual, try out some local dishes and make sure you have some Santa Clara pastries in the city centre. Coimbra is also very easy to reach from Lisbon and Porto. It takes just two hours to drive from Lisbon to Coimbra and just a little over an hour to reach Coimbra from Porto. 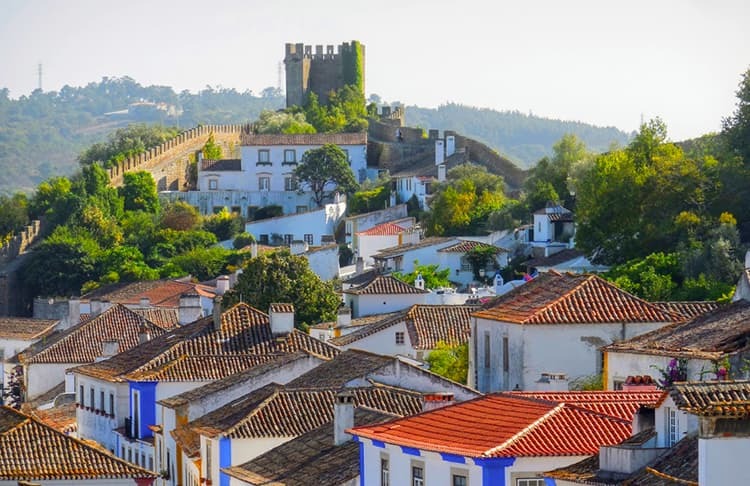 The enchanting town of Óbidos, with whitewashed houses and cobblestoned streets in central Portugal, is a great place to visit for peace and quiet. The entire city is encircled with walls which you can walk along and get fantastic views of the city. Also, stop at the medieval castle in the city which has been very well preserved and finally, do not miss out on a shot of Ginjinha d’Óbidos (a cherry liqueur). Óbidos is just a one-hour drive from Lisbon. There is also an express bus service from Lisbon to Óbidos which departs from Campo Grande bus station in Lisbon. A one-way ticket cost €7.95 with Rede Expressos. 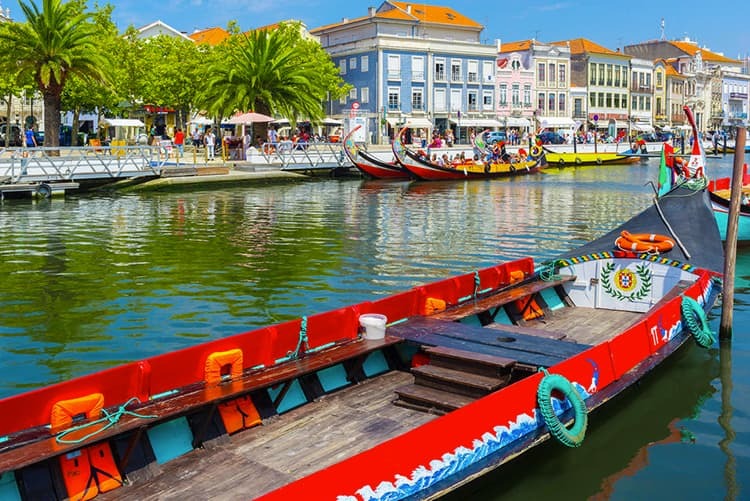 Popularly known as the “Portuguese Venice” because the city sits on the shores of a Lagoon called Ria de Aveiro which is linked with so many canals throughout the city. It is a colourful and charming city with fine beaches and great local cuisine. When you visit Aveiro you must do a Moliceiro tour of the city in the colourfully painted boats. This boat tour usually goes through most of the canals in the city and lasts about 45 minutes. I can recommend the Get Your Guide tour which will pick you up from Porto and take you through the city of Aveiro on one of the stunning boats. To book this tour in advance, click here. Moliceiro boats in Aveiro, Portugal. After doing that you can go into downtown Aveiro and explore the Art Nouveau houses, a typical feature of the Aveiro city. You might also stop at the Art Nouveau Museum if you please. 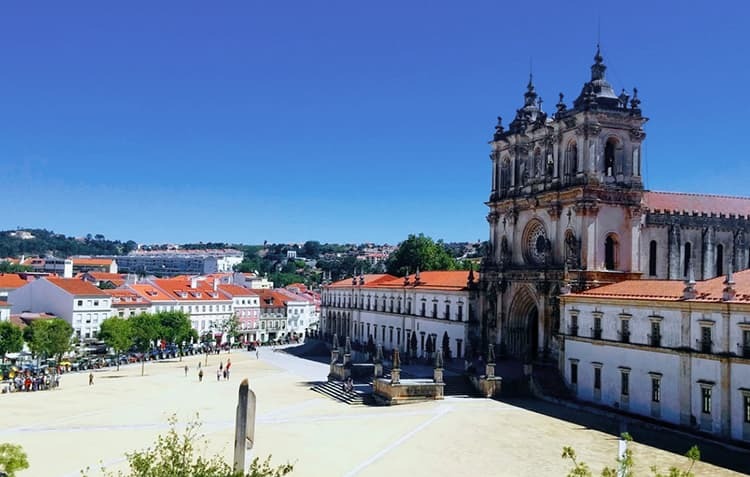 You can also make a quick stop at the Monastery of Jesus (“Mosteiro de Jesus”) a convent built between the 15th and 17th centuries. Finally, make sure you try some Ovos Moles, a unique delicacy of the city made from egg yolks and sugar, another invention of the nuns in Portugal. If seafood is your thing, then stopping at the fish market in Costa Nova is a must. You can buy and eat freshly caught fish. Peniche is another city in central Portugal with lovely beaches that attract surfers from all over the world and a few historic monuments. It is also a haven for seafood restaurants. Some local delicacies you must eat are the charcoal-grilled sardines and seafood rice. 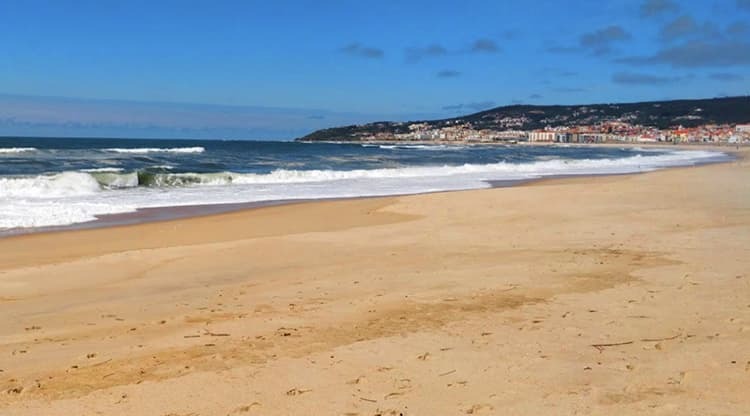 Nazaré is a popular summer destination with some of the finest beach resorts in Portugal as well as a popular winter destination for surfers – who surf the incredible waves at Praia do Norte beach. 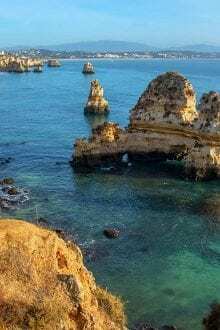 It is a town with delicious seafood and breath-taking scenery and makes for a relaxing day trip from Lisbon. The great waves at Praia do Norte, Nazaré. Portugal. Leiria is a picturesque town near the River Lis. The most eye-catching monument in Leiria has to be the beautiful hilltop Leiria Castle built by King Afonso. You should also make a stop in the city centre to see the Leiria Cathedral. After that, you can go for a stroll in the alleys and streets of Leiria to see very ancient and medieval houses. Located right in the middle of Portugal is one of the best cities to live in Portugal and home to the legendary Lusitanian chief – Viriathus. Viseu is a beautiful city surrounded by hills and pristine nature. It is also a city heralded for its immense collection of religious arts. 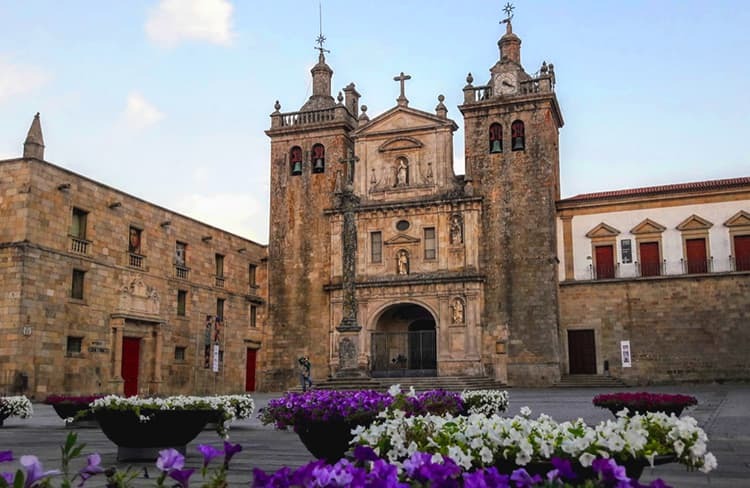 So, stopping at the Viseu Cathedral is a must as it is the most important monument in the city. It features impeccable Manueline and Renaissance architectural designs. You can also stop at the Grão Vasco Museum; a museum dedicated to curating the works of Vasco Fernandes – a famous painter from the 16th century. If you are feeling adventurous, you can venture a little bit outside the city limits of Viseu to Caramulo Mountain to enjoy some fresh air and see nature that would leave you marvelled. 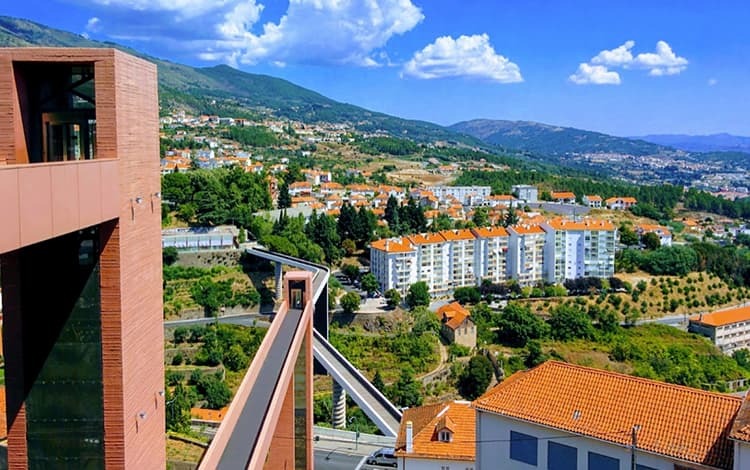 You can visit Viseu easily from Lisbon or plan a visit to Viseu along with a trip to Coimbra. The drive to Viseu from Lisbon is about three hours. There is also a bus connection by Rede Expressos to Viseu from Lisbon. The ancient and quaint town of Tomar, in central Portugal, was important in the formation of early Portugal as well as being a historic city for the Knights Templar in Portugal and the world. Some of the major monuments include the ancient Convento de Cristo – a world UNESCO heritage site. From there you can go for a walk around the National Forest of Seven Hills (“Mata Nacional dos Sete Montes”). You may also like to see the Matchbox Museum (“Museu dos Fosforos”) – a museum with one of the largest collections of matchboxes in the world. The Synagogue of Tomar is also another interesting thing to see in the city. Finally, you should stop at the lovely designed Praça da República, a place used as a model for squares in places like Lisbon. At the centre of the square, you will see the statue of Gualdim Pais, the most famous master of the Order of the Temple. While you are there feast on some Fatias de Tomar, sugary, syrupy and delicious. Tomar makes for a good day trip from Lisbon (if you go by car) but I like to stay overnight as a sunset walk along the river is so romantic. 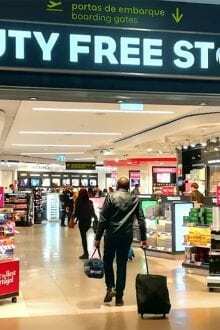 You can get there either by bus with Rede Expressos or by Comboios de Portugal train and if you prefer to drive, it takes one hour and thirty minutes to get to Tomar from Lisbon (this is on a Toll route). Alternatively, you can visit as part of tour of Central Portugal. A small, peaceful town in the hills of the Leiria area which is home to arguably the finest monastery in Portugal. 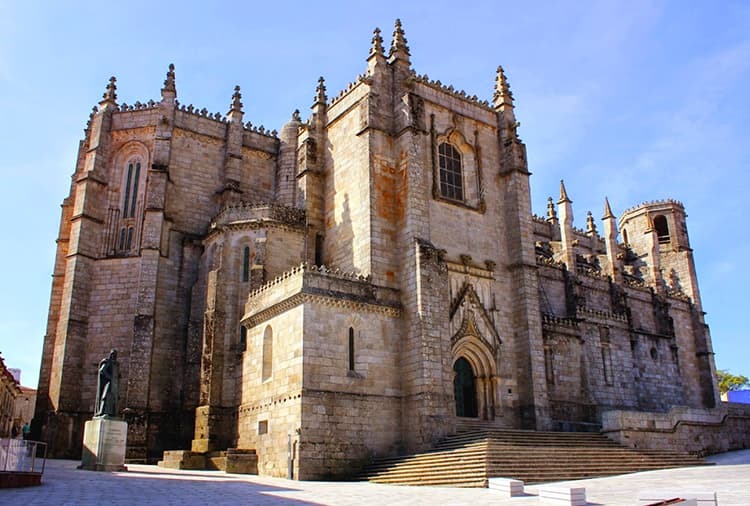 Mosteiro da Batalha is a UNESCO World Heritage that features extensive use of Gothic and Manueline architectural styles. 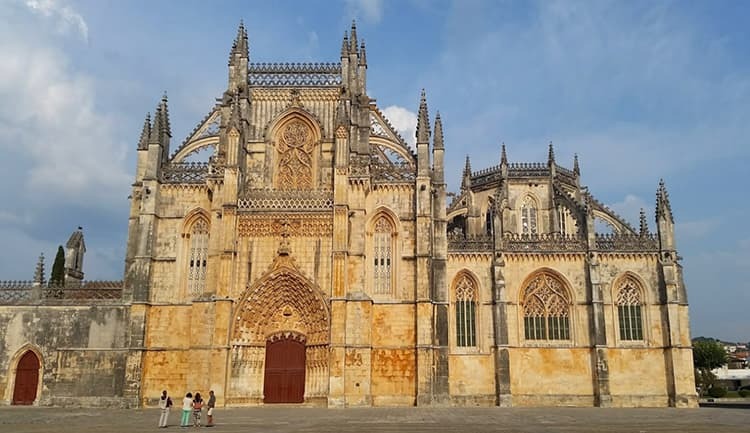 Another attraction in the town of Batalha is the Foundation of the Aljubarrota battlefield (website is in Portuguese) and the museum which presents the events leading to the battle and the battle itself in 1385. A visit to Batalha usually lasts a couple of hours. So, most people usually visit Batalha along with some other towns in the central Portugal area like Fátima, Óbidos and Nazaré. You can check Get Your Guide for an organised tour to visit the monastery and the surrounding towns. 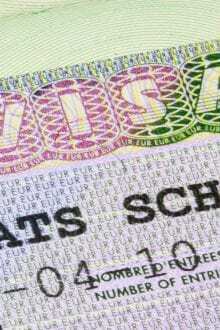 If you want to go by yourself, you can get a bus from the Sete Rios bus station in Lisbon. A return bus fare costs €20.40. You should also know that the bus service to Batalha is not so frequent. Check the Rede Expressos for schedules. Situated in the Serra da Estrela mountains, Covilhã is a city that was once revered for its wool and textile production in Portugal. If you visit Covilhã, you must try out the local goat cheese from this region as well as the lamb dishes. Also, a definite stop here is the Wool Museum (“Museu de Lanifícios“) where the textile heritage of the city is preserved. The other interesting place to see in Covilhã is the old Jewish quarter. 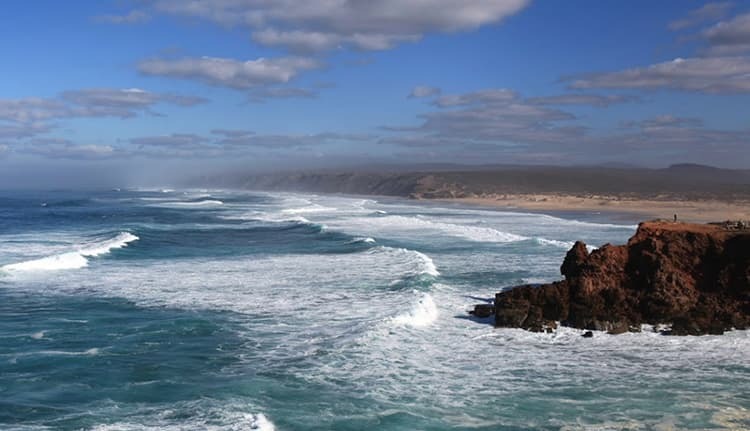 Figueira da Foz is a city blessed with an enormous stretch of sandy beaches and several historic monuments. It is a popular summer destination especially for beach lovers and those who like to party on their holidays. Claridade Beach at Figueira da Foz, Portugal. There is also a Casino in Figueira da Foz, you can stop there if you’re feeling lucky. Other attractions in the city are the Clock Tower and Abadias Park. For the most up to date information about visiting Portugal, be sure to subscribe to our weekly newsletter. 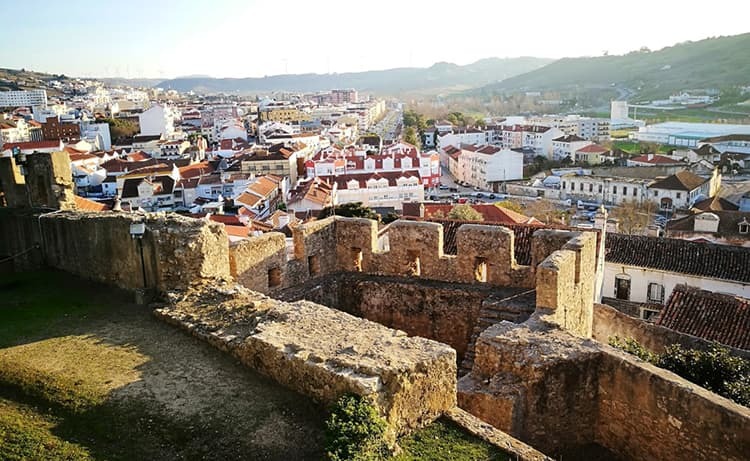 Castelo Branco is home to a Templar castle that dates as far back as the 13th century and it was once the seat of the bishop. 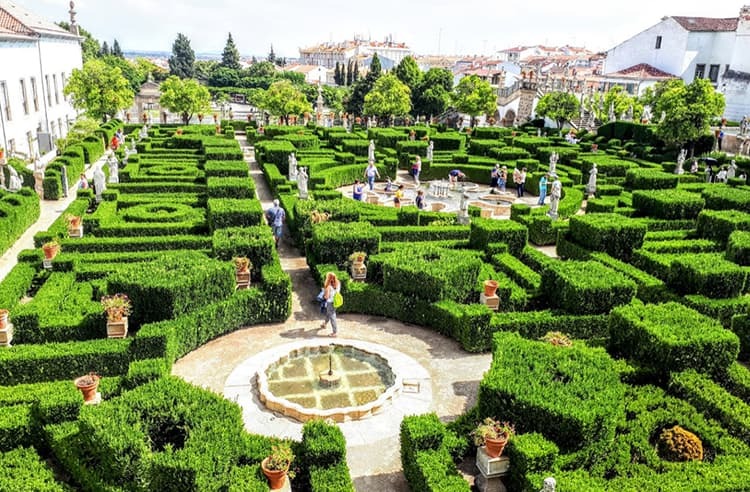 One of the most beautiful things to see in Castelo Branco is the garden of the Bishop’s Palace; a beautiful Baroque garden with five lakes. Bishop’s Palace gardens in Castelo Branco, Portugal. You should also try traditional “empadas de Castelo Branco”, a local tasty delicacy. You can check Rede Expressos for bus schedules and Comboios de Portugal for train schedules. Fátima is home to The Sanctuary of Our Lady of Fátima one of the most important Catholic sites in Portugal and the world. 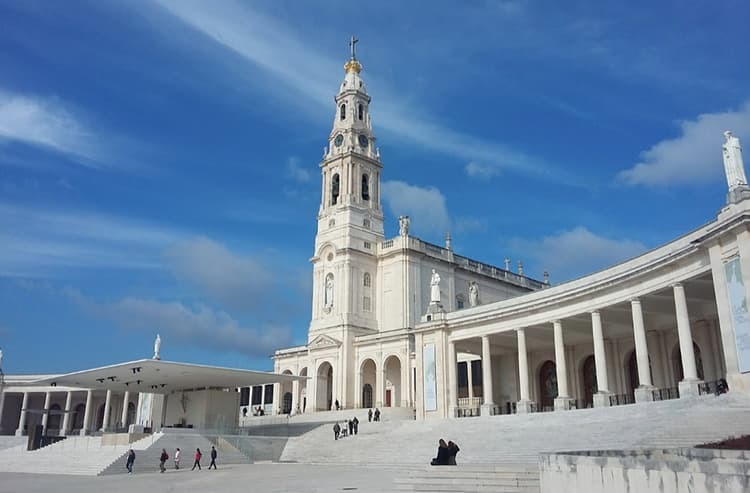 You should visit the Chapel of the Apparitions in The Sanctuary of Our Lady of Fátima where it is believed Virgin Mary appeared to three young shepherds. The Sanctuary of Our Lady of Fátima, Central Portugal. Although Fátima is famed for religious visits, it is still, however, a place anyone can visit to see the enormous plaza and the Basilicas. Also, you can plan a trip to coincide with the pilgrimage days which usually happens between May and October. If you are not driving to Fátima, the best option is to go by bus. You can check Rede Expressos and Rodotejo (website in Portuguese) for bus schedules and fares. Located in the Serra da Estrela mountain region, Guarda was founded in the 12th century by the second King of Portugal and it features numerous religious monuments, medieval houses and castles. The most standout attraction in Guarda is the Archaeological Park of Foz Côa – a protected site known for holding one of the largest collections of Palaeolithic art in Europe. The Cathedral of Guarda (“Sé de Guarda“). You can easily also visit Castelo Branco and Coimbra along with your trip to Guarda. Alcobaça is situated in the valleys of the rivers Alcoa and Baça and the home to the Monastery of Alcobaça (a UNESCO World Heritage site) which is over 900 years old as well as being a prime example of Cistercian architecture in Portugal. Other nearby monasteries are Monastery of Cos and the Batalha Monastery (mentioned above). 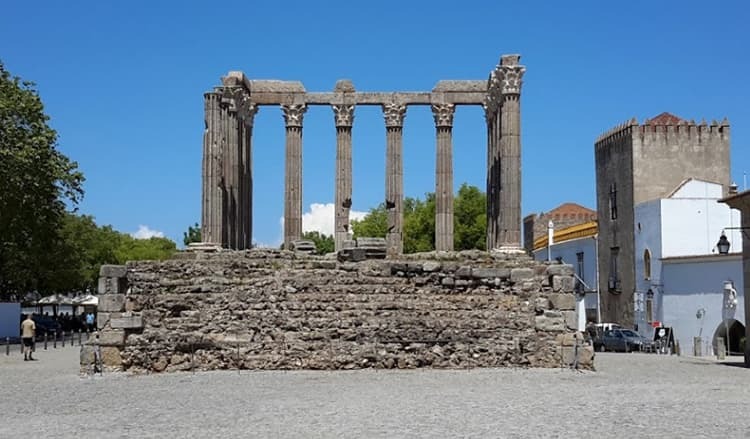 Roman temple at Évora, Portugal. The Carnival in Torres Vedras is a fun-filled extravaganza, so you should plan to visit around that time. Caldas da Rainha is only one hour away from Lisbon. 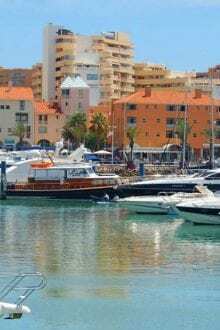 It is a lovely little town for a perfect relaxing holiday or a day trip from Lisbon and is home to magnificent resorts with superb golf courses. 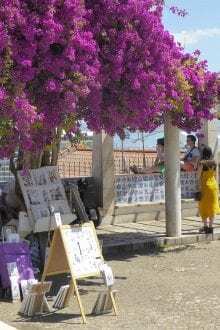 Caldas da Rainha also has a vibrant market where you can buy fruits, vegetables and fish. 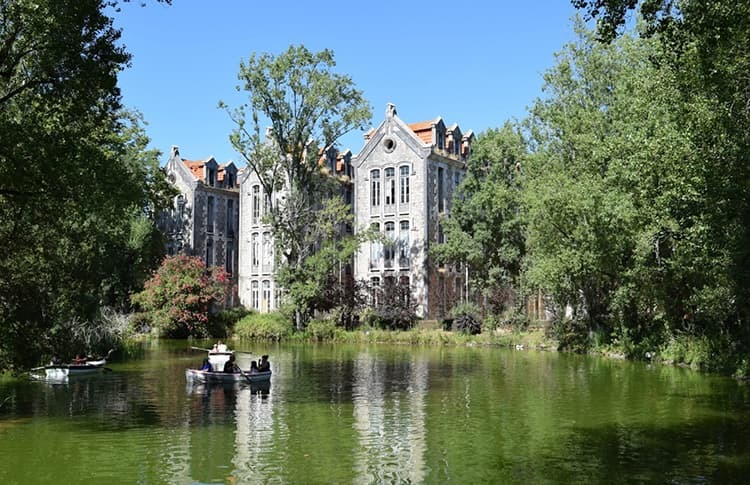 You can also enjoy some nature and green spaces in the Don Carlos Park. Dom Carlos Park in Caldas da Rainha, Portugal. This is a mountain range in central Portugal with exceptional beauty. 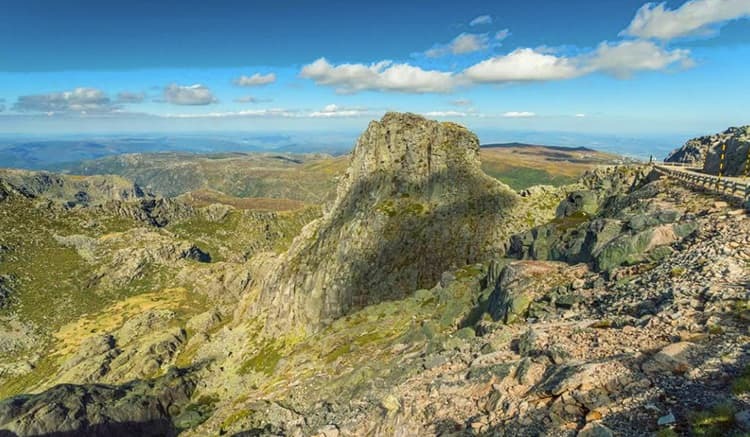 In Serra da Estrela you must visit the Natural Park which spans over one hundred thousand hectares. Also, a compulsory souvenir to buy in Serra da Estrela is the Serra da Estrela cheese. If you are up to it, you can also climb to the summit of the Estrela Mountain. Serra da Estrela mountain range, Central Portugal. This is a hidden gem in central Portugal which is rarely on the radar of tourists. 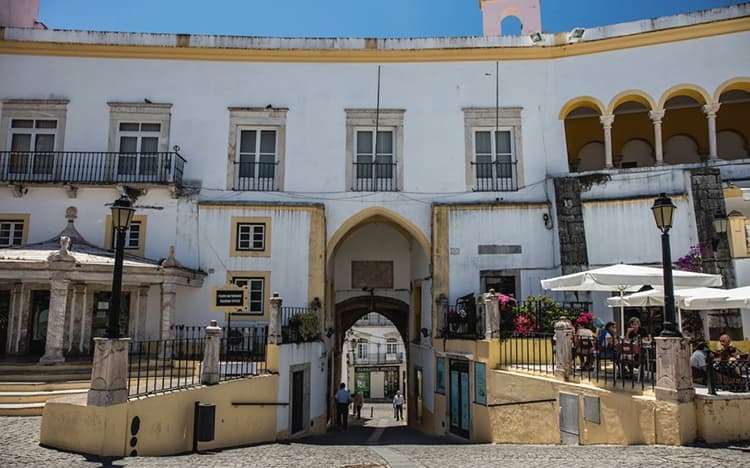 Elvas is a picturesque town with an intriguing history. 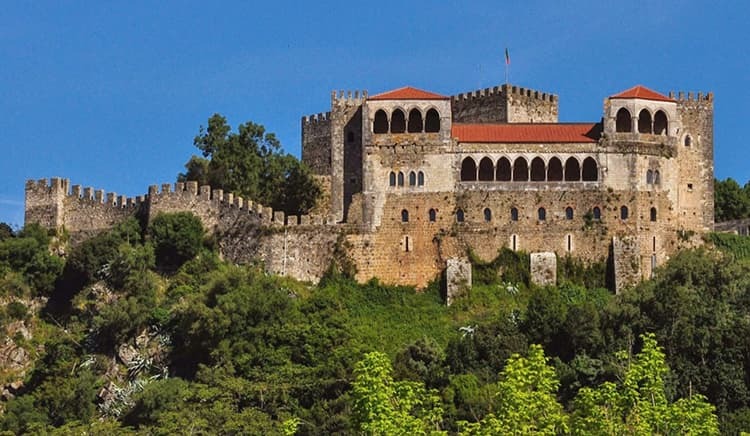 Hopefully, this list helps you in deciding where to visit in central Portugal, so you do not miss out on visiting some of the most beautiful and historic towns in central Portugal. What is your favourite place in Central Portugal? Let us know in the comments below.